Dunkin' Donuts says it plans to offer new gluten-free cinnamon-sugar donuts and blueberry muffins by the end of this year. Dunkin' Donuts isn't exactly known as a dieter's paradise, but it'll soon have the gluten-free crowd covered. The breakfast chain said Wednesday that it plans to offer a pair of new gluten-free items -- cinnamon-sugar donuts and blueberry muffins -- by the end of this year. 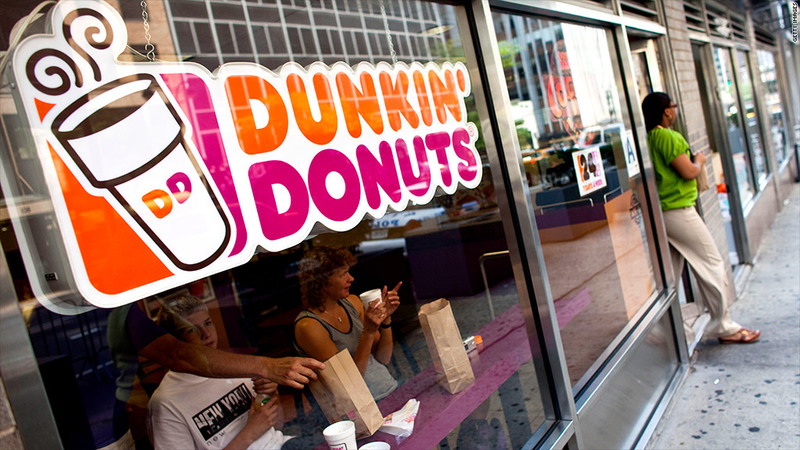 "At Dunkin' Donuts, we recognize the importance of providing our guests with many options, including alternative choices for people with food and dietary restrictions," Dunkin' (DNKN) PR director Michelle King said in a statement. "We understand that sensitivities to food ingredients such as gluten are a serious concern for certain guests." Gluten is the major protein found in grains like wheat, barley and rye, as well as in some deli meats and other packaged products. For people with a condition known as celiac disease -- about 1% of the population -- even small amounts of gluten can prompt severe discomfort. But others without this condition can still have mild reactions to gluten, and many have adopted gluten-free diets in recent years, leaving the fast-food industry scrambling to keep up. Domino's (DPZ) now offers pizza with gluten-free crust, though the pizza chain notes that the crust is prepared "in a common kitchen with the risk of gluten exposure," meaning it's not recommended for customers with celiac disease. Chipotle Mexican Grill (CMG) also offers a number of gluten-free options.